The Reel Rhino: Meddy New Year...Let's Talk Movies! I can never get enough of Trading Places and that clssic Eddie Murphy line...Meddy New Year! "It's Happy New Year. In America, we say Happy New Year!" Damn that Clarence Beaks! It is moments from the dawn of the new year. By the time I hit 'publish,' it'll be Ought'11 and we will be off and running in a new movie year. I made it to 122 movies at the theater this year, with a few of those repeats for some of the greats and some of my popcorn-eatin' favorites. I will be working on my best-of/worst-of list for the year and I am sure that there will be some standard entries from around the 'net but also some uniquely REEL RHINO ratings. I had Dec. 26th through Dec. 29th evenings free for movie going, so what did I do...of course I rallied and went to a movie a night for the whole stretch! 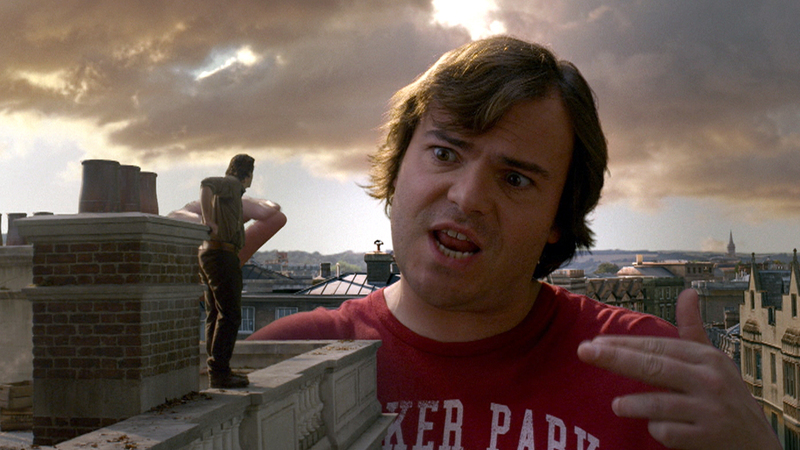 This is not your average Jack Black movie, not by a long shot. Yes, there is your standard Jack Black left-right budda-dump-dump-dump hop but it is clearly not his standard wacky role as this film is geared much more towards a family-friendly entry Now Gulliver's Travels does have a fair amount of slapstick, but it definitely has a different tone, but as to the family friendly thing, I'll get to that in a minute. For me, I thought this might be a good thing. Except for Tenacious D: The Pick of Destiny and School of Rock, I haven't much been a fan of Jack Black. I think he would be a great wacky friend, the constant life of the party kind of guy, but hey....that's my job, dammit! 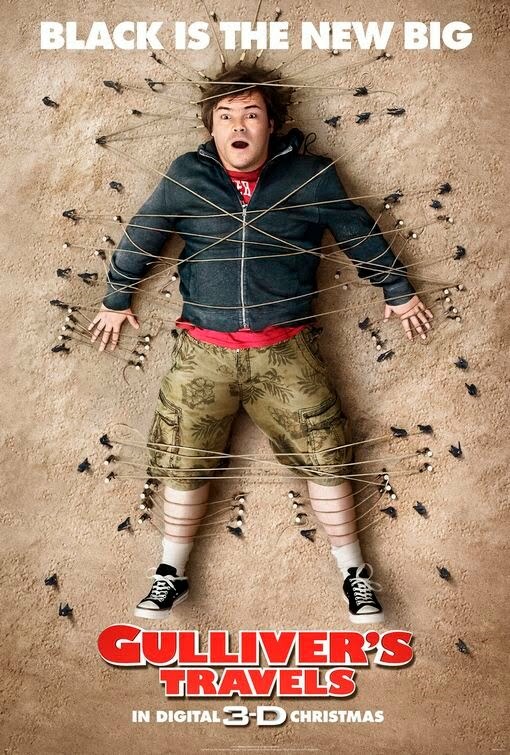 Our man Gulliver is the head of the mail room for the first few minutes of the movie, before he is passed over by the new guy, played by 'Stainer' from She's Out of My League, T.J. Miller. Gulliver is a classic under-achiever and he has a secret crush on Darcy Silverman (Amanda Peet), who is the editor of the travel section at a major New York newspaper. He fudges a bit on an effort to impress Miss Darcy and she hires him as a travel writer with his first assignment to investigate a claim about the Bermuda Triangle. A crazy boat trip ensues, a large twister waterspout forms at sea, and the hapless Gulliver crashes on what we soon learn is the island of Lilliput. That would be the savior of the King of Lilliput, played by Billy Connolly, and Princess played by Emily Blunt. Both of these roles are played splendidly as both are fine actors. This was not enough to save the film. 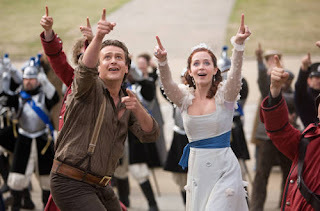 Jason Segal as the commoner-come-lately suitor to the Princess competing with the foil to Gulliver, the General of Lilliput, Edward, played by Chris O'Dowd. I will say that there are ups and downs that follow, but it is all quite mundane. The humor in this film is rather juvenile. While Roger Ebert (who I personally respect and admire) writes that this is the family movie solution to counter the darker offering that was the poorly received re-envisioning of The Nutcracker, I strongly disagree. While The Nutcracker may not have been that great of a film (I did not see it), I offer that this really is no family friendly film. This movie prominently features the always hilarious (please read as sarcastic) kicking in the nuts, atomic wedgie giving, fart blasting, and water-sports, yes, WATER-SPORTS, of the (not-so) HILARIOUS variety. The last 10-minutes of the movie actually have some decent comedic moments and it includes Jack Black doing what he does 'well,' sing and do that side-to-side, left and right hippity-hop. 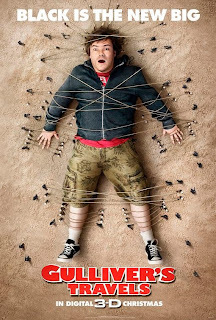 I give Gulliver's Travels a 2 of 5 horn review and that is mainly due to those last few moments and also the acting, which while of poor content, is still entertaining for seeing these otherwise very talented folks giving their all. Make this a rental at best, and certainly leave the kids out of the equation, unless you want them running around peeing on each other for fun. This is an art film, make no mistake about it. That AMC carried it is surprising and while I appreciated that fact for convenience sake, it is very much more suited for the art house or boutique theater. This movie is a hard-R, with the widest variety of cursing and adult behavior afoot. Natalie Portman plays the role of a prima ballerina who achieves her dream of snagging the lead in the upcoming ballet interpretation-nouveau of the classic Swan Lake. This movie also features Vincent Cassel, Barbara Hershey, and my favorite, Mila Kunis, who is both adorable and completely watchable in everything she is in. Kunis is Lily, the foil to Portman's Nina, or is she? It remains quite unclear as to who is in who's court including Nina's mother, played by Hershey who runs the household in a manner that would make Mommy Dearest proud. Throw in Winona Ryder as the previous princess of the ballet to the director, Cassel's Thomas (Franch pronunciation in play -Toe-mas), and you have quite a cast! The whole movie is something of a mind-bender and it is a drama that plays much like a thriller or even a horror film, with some stunning dark visuals. 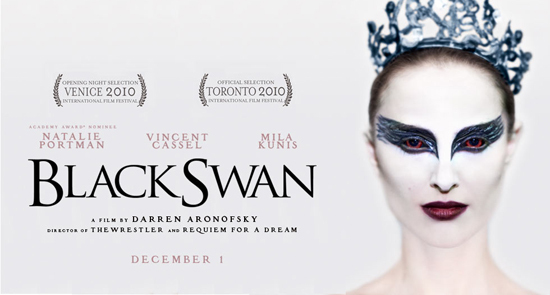 Darren Aronofsky is a fantastic director with a true vision and this is a movie to be celebrated. You will be thinking about it for some time after those final credits role and while any ballet is a work of art that is open to interpretation, the internal content of this film and at the same time the internal artistic interpretation within the ballet within the movie are open to interpretation. (Wrap your mind around that!). If you walk out with a thorough lack of understanding, you will not be alone. The film is one to be enjoyed visually and one that gives you the ability to apply your own meaning to the themes and tones presented by Aronofsky. Many online reviews have already applied a parallel to his previous work, The Wrestler. As I watched the film, I was thinking how Black Swan rivals any of the best sports films ever made. Nina's uncertainty and thoughts of self-doubt are the same as those felt by any athlete characters at those critical moments of our favorite sports flicks. BLACK SWAN picks up 4 of 5 horns for that bit of existential uncertainty that I walked out of the theater with and that I hold with me to this day. By far the gem of my week's trip to the theater. 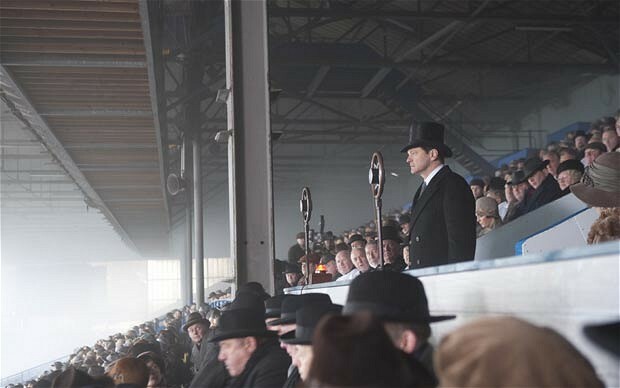 Colin Firth plays His Highness, Prince Albert of York, the man who would become King George VI, leader of the British Monarch during World War II. 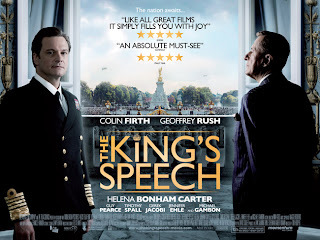 This movie introduces us to the Royal Prince long before he takes the throne and when he is deeply crippled by a stammering speech impediment, a true disability as it has a sharp mental hold on him as he is often required to speak in public. 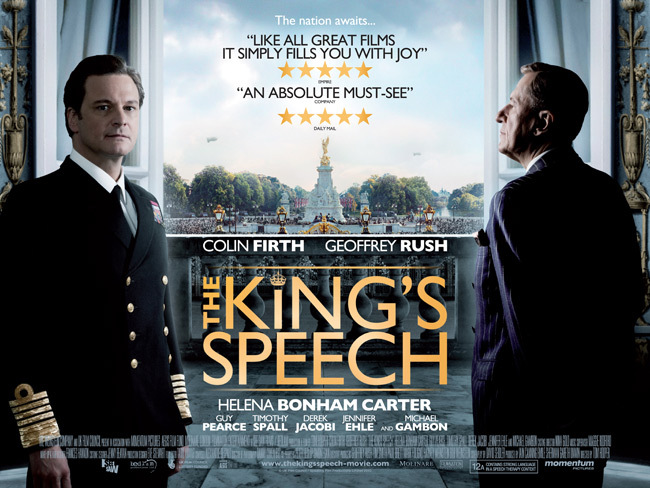 Enter Geoffrey Rush, who plays a Lionel Logue, an unorthodox speech therapist who is seemingly the Prince's last option after a slew of more respectable Doctors have failed. Logue is sought out by the Prince's wife, Lady Elizabeth, played by Helena Bonham Carter. Elizabeth is a caring wife who holds out hope when the Prince has none that he will ever be cured of his impediment. Each and every actor in this film is stunning to watch as they embody the roles that they play. This film is very much a drama but it has an undeniable sense of comic timing. This film started off in the smallest theater in my home AMC and it built up to the largest. It was 3/4 full when I saw it and there was immense laughter at the most appropriate times that made the watching so enjoyable. I typically cringe at the applause that occasionally follows a film. Who are we cheering for? Are there actors or maybe the director in the theater? Typically no. But here, it felt so organic, I even joined in. Logue's work with Bertie is intense and occasionally bizarre. Bertie is the pet family name for the Prince that Logue uses as to help set on them on even footing in their efforts to eliminate the speech hindrance that the Prince endures. 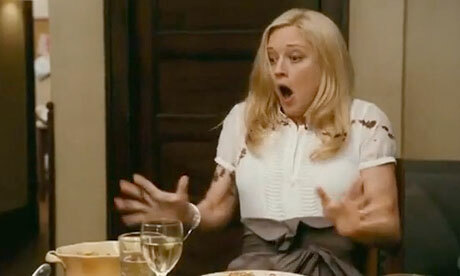 In a nutshell, this film will make you laugh and cry. It is a joy to watch and while it is rated R, I would say that other than the language in a few scenes, it is a touching story good for the PG-13 crowd or older. Please see this film, you won't regret it. A super duper deluxe 5 of 5 horns for this gem, without a doubt which will find a place in my top 10 of the year. Ranked in the basement, my least favorite of three in the 'Meet the Parents' series, this film will not be making my top 10 list and it is quite possible destined for the bottom 10. This film is racked with stars, including it's banner stars of Robert DeNiro and Ben Stiller. This film lacks the sensitivity that the first had in droves and the second had in flashes. This film reduces the comedy of relationships to a series of puke and fart jokes. Now this is my second condemnation of juvenile humor in this post. I am very much in favor of a good bit of juvenile humor to supplement an otherwise enjoyable movie. But when a movie relies on it to sustain the laughs, I'll pass. Bob DeNiro getting an epi-pen in his unit could have been funny if that was the extent of it, but this film takes it a bit further. Also, why ruin a scene like this on the preview? This is a sad third offering and I regret to give it a 2 of 5 horns, perhaps only for the bits of scantily clad Jessica Alba which is always a welcomed addition to any film. 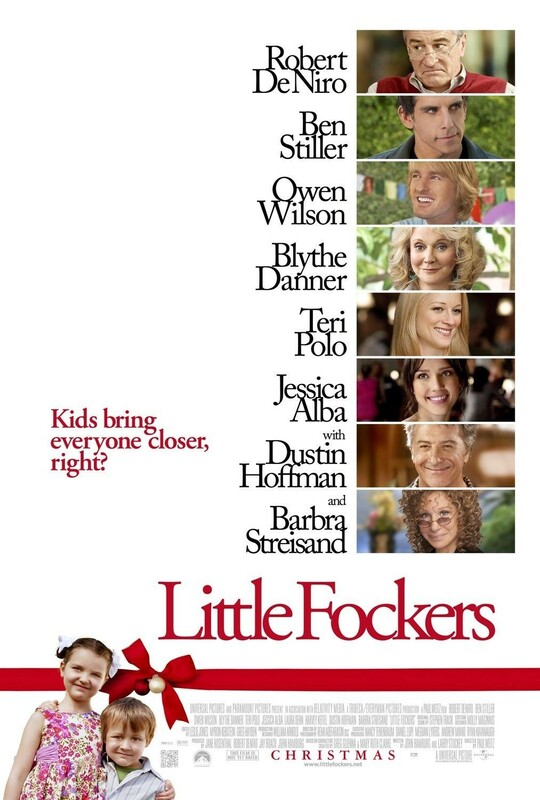 Owen Wilson continues his forlorn pining for Pam, Greg Focker's wife, as Focker pushes to become the God Focker, the heir to the Jack Byrnes family throne. Blythe Danner is underused, the Hoffman, Streisand, cameos are literally phoned in for all but one scene. It is hard to believe that the talent here didn't realize that ship was sinking and take action. There is no way they read this script and saw greatness. I think that this was made as a payday film. I would have preferred the rumored Jack Byrnes/Gaylord Focker black-ops mission to the Middle East movie that was rumored for several years. I would have taken anything but this. Where as the first two movies were funny inherently, meeting the future in-laws for the first time, this movie has no constant theme. Whereas the title has you thinking the kids will be the pivotal hinge-pin in the forwarding of the plot, we get a series of awkward situations, at the conclusion of which everyone on screen reacts in horror or shock, with audience laughs meant to ensue. Not the case here as only the most base jokes got laughs while many of the intended funny sequences dropped off cold. It is a rental for the sheer allegiance to the Parents franchise and to these characters, but prepared to underwhelmed. As appreciated as it was, not even the scantily clad vixen Jessica Alba could save this (although she is adorable and enjoyable as always). Again, a 2 of 5 horn effort. For good or for bad, it was a hell of a four-day run. I will hopefully get to a New Year's movie tomorrow or Sunday. NO NEW RELEASES at the big theater houses, but I think that Blue Valentine has hit the Fine Arts Group or the Tivoli here in Kansas City. For now, the REEL RHINO says HAPPY NEW YEAR!! Here's to a great year at the movies in 2011.